► Does an eco-SUV make any sense? The Porsche Cayenne. A car that’s divided opinion because of its mere existence, but also because of its divisive looks and Chelsea tractor image. Now you can have your large Porsche SUV-sized cake, eat it and feel that little more smug about it, thanks to this new E-Hybrid model. Introduced into the Cayenne’s range after the rest of the petrol line-up, the E-Hybrid is the one you’ll be interested in if you want a luxurious SUV but don’t want your judgemental friends to think you don’t care about the environment. Under the bonnet of the Cayenne E-Hybrid is a 335bhp 3.0-litre V6 turbo petrol plus an electric motor pushing out the equivalent of 134bhp. That equals a total system output of 456bhp, making it one of the most powerful Cayennes in the line-up, toppled only by the blistering V8 Turbo model. On a full charge, it serves up a 27-mile EV-only range thanks to a 30% greater battery capacity than the previous Cayenne S E-Hybrid (it’s now a 14.1kWh pack under the boot floor). Porsche’s Sport Chrono Package comes as standard, meaning you get a choice of drive modes – E-Power, Hybrid Auto, Sport, Sport Plus and the magic Sport Response button in the middle of the steering wheel-mounted switch for a 20-second blast of performance. Porsche’s Active Stability Management is thrown in as standard. When Porsche refers to the 918, it’s that it operates the same boost strategy to the hybrid hypercar. In simple terms, the combination of petrol engine and electric motor (and all of its torque) is on tap almost instantly when you put your foot to the floor. And you certainly notice the 516lb/ft sledgehammer of torque sending you down the road when you require it. 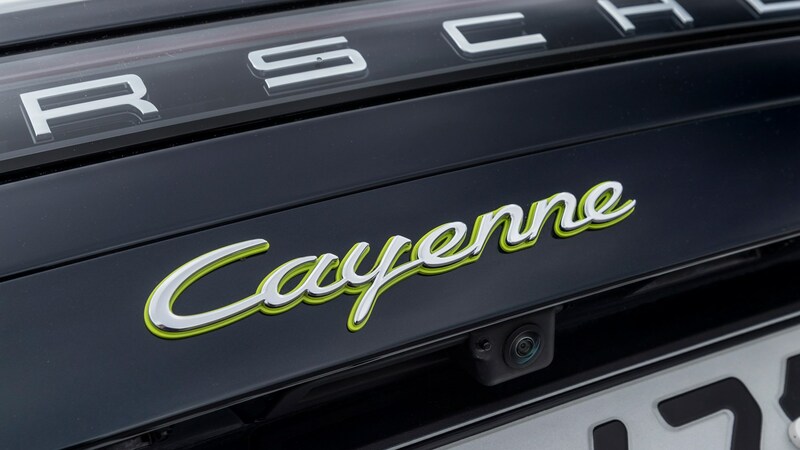 Does a big, heavy eco-Cayenne drive like a Porsche? Yes and no. The Cayenne E-Hybrid defaults to driving in electric mode, but you’re more likely to switch it into Hybrid Auto for everyday driving. That said, the Cayenne holds onto the chance to stay in EV mode as much as possible, so you’ll likely spend a lot of time creeping around town in total silence. And there’s something very satisfying about that. Get out onto an open road, however, and the temptation to twist the drive mode selector to Sport or Sport Plus is very strong. Thanks to that 3.0-litre V6 under the bonnet, this most polite of Cayennes becomes much more boisterous with a howl coming from under the bonnet (and out the back of the car if you spec it with the optional sports exhaust). 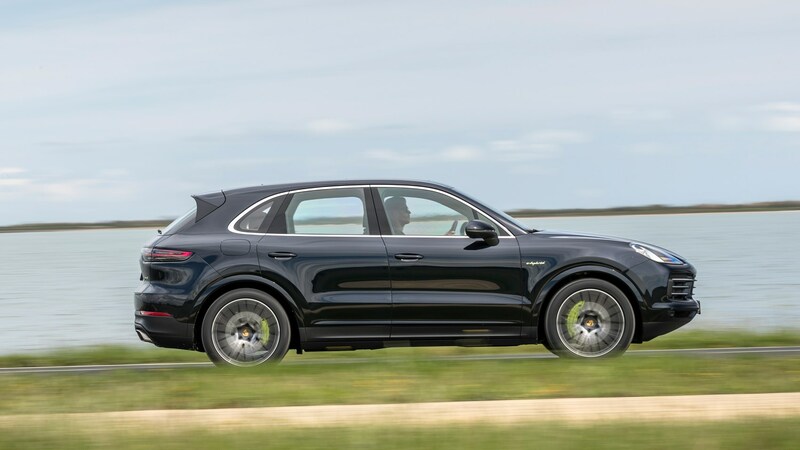 In Sport Plus and taking manual control of the slick eight-speed Tiptronic gearbox, the Cayenne absolutely flies down the road, attacking bends like a car half its size, and with seemingly endless grip levels helping you to catapult out the other side. Push too hard and the Cayenne’s bulk can’t be hidden forever, though, but it acquits itself incredibly well as a fine-handling SUV. There’s only so much you can do to control a car’s heft, and the Cayenne is hefty. Driven like this and it’s quite astounding that a car can feel as nimble as this when it weighs so much, feeling like a proper Porsche SUV. But if you’re driving it like this, why on earth did you buy the plug-in hybrid version? A significant draw of this latest Cayenne is the superb interior. 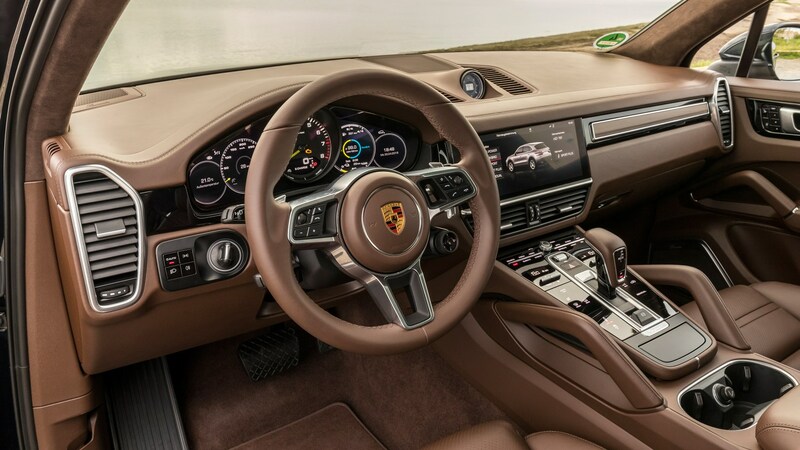 It’s similar to the Panamera’s in that it’s cocooning without feeling too snug, a proper tech-fest with a huge touchscreen to control the main functions, plenty of glossy black panels, slick dials and superb, quality feel. It’s roomy, too (as you’d expect from a big SUV), and the penalty for having those hefty 130kg batteries on board is a boot that’s 100 litres smaller than a regular Cayenne. Don’t worry too much, it’s still plenty roomy enough. The Cayenne E-Hybrid is a versatile machine that won’t disappoint if you MUST have a large, luxurious yet sporty SUV, but are becoming increasingly concerned that people are judging you for having such a thing on your driveway. The only way it makes sense is if you’re able to charge it regularly and really benefit from that 27-mile electric range around town. The e-Hybrid is a very satisfying car to use around town in complete silence, and the performance on offer out of it feels like it’s still very much a Porsche. However, if you’re likely to run the battery down and never put it on charge, just get a normal Cayenne and be done with it.